I live in a cycling town. I see people everywhere riding their bikes along the beautiful greenbelt, biking to work, parents riding with their kids, parents pulling their kids in bicycle trailers. Me? No. I don’t have a bike anymore, and I’m not in a rush to have one. I even get a little queasy when I see a whole family riding in the skinny bike lane on a busy road. We visited Fort Worth (I’m from there) last summer, and we spent almost a week at my best friend’s house. She decided we were going to go for a bike ride at the park one day, and the men took care of the kids while we were gone. I think she had this idea that we could go really fast since there were no kids along, the wind whipping through our hair, etc., etc. She had no idea I’m a huge bike chicken and that it would be more the speed of a leisurely stroll. Back in, I don’t know, 2002 or 2003, I had a major bike crash. I was out riding with a friend, and it had started raining. We were almost to our destination, Busy Bee’s Bakery (this was back when I could eat gluten and could easily devour a half dozen of the best sausage rolls in the world in under a minute), and we decided to cut through a parking lot, since we were going to be riding on a busy street. I managed to catch the side of my front tire just so on the little ridge between the side street and the parking lot, and I went down hard, thankfully in the parking lot and not the street. I wish I had a picture to show you (but you’re probably glad I don’t) of all my injuries. I scarred up both of my arms and scraped both knees, but the worst injury was to my right thigh. I had a massive black contusion on my thigh when all was said and done — you know, the kind of contusion you’d like to show off to everyone (but can’t because you’re modest and the contusion is close to your hip), because, hey, if it’s gonna hurt this badly, you want to get a lot of applause that you’re still walking upright and not whining (much) after such a horrific injury. You want credit, yo. This was a humdinger, between the size of a volleyball and a basketball. And my skin wasn’t back to its usual color for at least six months. I think I have some scar tissue in my thigh from it, actually — I can’t really lie down on that side comfortably. So yeah. A bit of a bike chicken. My best friend still loves me anyway. And I still like to look at bikes even if I’m a big baby about riding them. And I love the current trend with the ’50s-looking bikes coming back into style. They’re so cute! That’s why I love this stamp set. The layout is from this week’s challenge at Freshly Made Sketches. 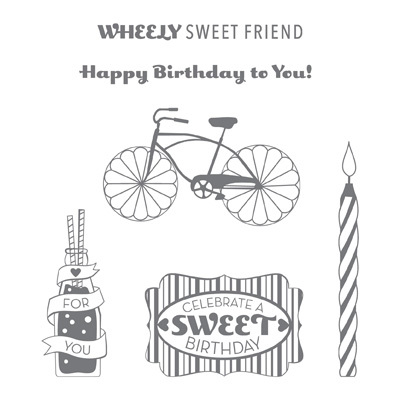 The designer paper is from Birthday Basics, one of my favorites this year. The buttons are Bermuda Bay, from the new Brights Designer Buttons pack. I stamped the bike and “sweet” in Raspberry Ripple, and the rest of the sentiment is in Bermuda Bay, a color that I didn’t love when they first reintroduced it this year but that is quickly growing on me. And the card base is Summer Starfruit — I actually loathed this color when it first came out last year, but I think that’s because I always saw it paired with Midnight Muse, and I just don’t care for that color combo. But I love it with these colors (and also with my beloved Island Indigo). I hope you like the card! If you haven’t tried Paper Pumpkin, remember that if you subscribe before August 31 using the promo code “PUMPKINDEAL”, you receive your first two months for $10 each! So there has never been a better time to give it a try. 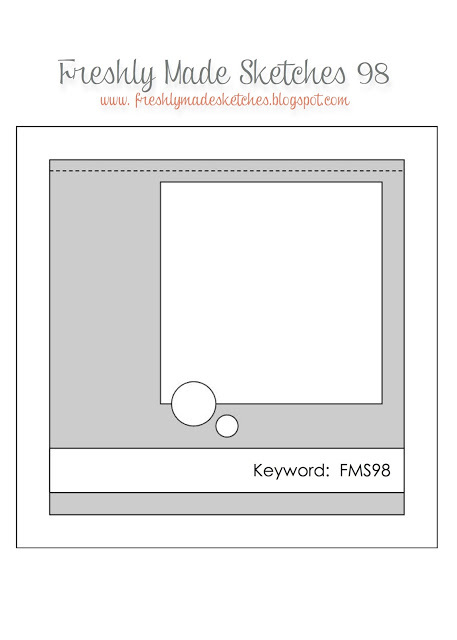 You can buy these and many other fantastic products in my Stampin’ Up! store! This is so cute! 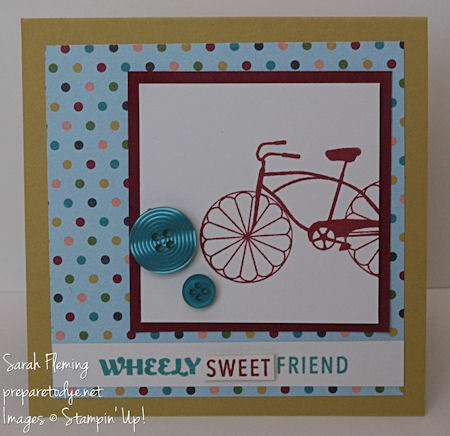 I love how you only stamped part of the bicycle on the card. Thanks for joining us at Freshly Made Sketches! Adorable card! I love this bike and you used it perfectly. Glad you joined us this week at FMS!